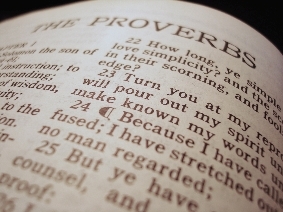 The Book of Proverbs, much like the Book of Psalms, provides various opportunities for learning for members of the Christian faith and Hebrew faith. The Book of Proverbs, much like the Book of Psalms, provides various opportunities for learning for members of the Christian faith and Hebrew faith. The lessons contained in this book are similar to the lessons contained in the Book of Psalms, but they take on a more narrative and literary approach to explanation. While the individual believed to have written the book is still debated by theologians, the wisdom contained in the stories is not refuted, and is seen as an additional opportunity for learning about one’s faith and practice. Throughout the book, references are made to those who are wise and those who are foolish; the former is used to symbolize those who believe in God and practice their faith while the latter is used to symbolize those who are lacking in traditional morality. While the terms themselves can certainly be linked to one’s respective level of intelligence, they are more commonly used to explain one’s connection to one’s faith, and whether or not this makes one wise or foolish. Wisdom in this book is most commonly passed down from the older generation to the younger, something that is traditional in most cultures. However, at numerous times throughout the stories, wisdom is passed down from mother to son, and the character of Wisdom is commonly perceived to be female. This notion of feminine wisdom, whether passed down to daughter or son, contradicts many of the common practices of the church that deny women a place of prominence. It is interesting to consider the social causes for such practices when the holy texts themselves do not support them. Wisdom in the Book of Proverbs comes from a variety of settings and sources, including the home and family, the courts, and the school, but the underlying theme remains the same: knowledge is to be passed from one generation to the next and wisdom is representative of one’s dedication to one’s faith. Paper Masters writes custom research papers on The Book of Proverbs and discuss the various opportunities for learning for members of the Christian and Hebrew faiths.